The iconic Chowder House in Boothbay Harbor closed on Labor Day weekend after 40 years in business. 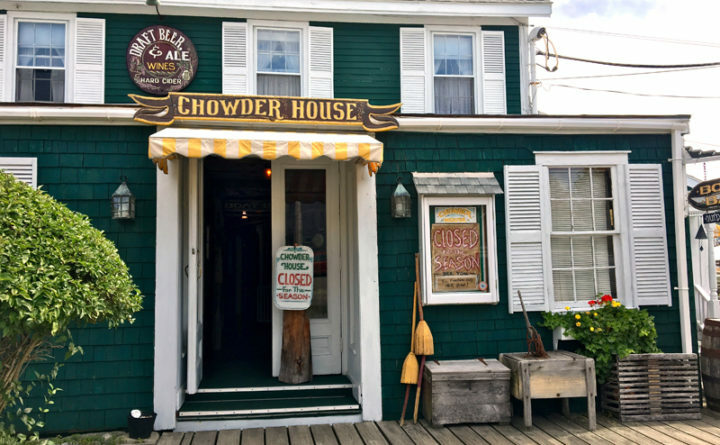 The iconic Chowder House at 22 Granary Way in Boothbay Harbor has closed its doors after 40 years in business. The building was lacking in doors and windows. A self-described scavenger, Bob started collecting “treasures” to incorporate into his new building. “I went to the dump and picked up all the building materials and junk I needed and slammed it together,” he said. The couple will spend this winter, as they have for many years, in Whitefield, New Hampshire, where Sally is from. Bob will pack up his woodworking tools for transportation to his workshop there. The Chowder House is not being sold, yet anyway. The Maroons plan to rent out the space for private functions next summer. For more information, visit chowderhouseinc.com, email chowderhouseinc@hotmail.com, or call 633-5761.